Some people may roll their eyes at the idea of UFO sightings, while others are certain they have seen alien craft. Now a data visualisation expert has created a map of the US showing almost 90 years of official UFO sightings, including information such as the time of day they are typically noticed in different months. The data also reveals that UFO sightings of fireballs are the most common, while egg-shaped craft are the rarest over time. John Nelson combined census data with statistics compiled between 1925 and 2014 by the National UFO Reporting Centre to make his maps. ‘Of course, as is the case for any observation data, there is a strong tendency towards echoing a population map’ he wrote on his blog. To do this, he created a map showing sightings by population density, as well as maps based on more complex calculations to build the most accurate maps he could. States where UFO sightings are most common include Maine, Washington, Arizona, Nevada, which happens to include Area 51 and New Mexico – the location of the famous Roswell Incident occurred in 1947. The US military claimed they recovered a secret research balloon that had crashed, but conspiracy theorists say the wreckage of an alien craft was discovered and hidden. Mr Nelson also used the data to create a chart showing UFO shape by sightings, as well as the times when alien craft are commonly spotted. ‘Most interesting to me is the variability of our concepts of shape and how they reflect our own changing notions of design and certainty through recent decades’. He said that more fireball-shaped UFOs have been sighted recently, compared to the previously popular disk-shaped craft, which are popular in sci-fi films such as Close Encounters of the Third Kind. ‘Physically analogous shapes like Disk and Egg? So mid-century materialist chic,’ he explained. ‘Uncertainty? So late-century neo-relativism. Flaming lights? Such millennial clarity. ‘No matter the phenomenon, crowd sourced data tends toward a first-order trend of how we see ourselves. In 1983, just nine per cent of UFO sightings were ‘fireballs, compared to 38 per cent in 2013. Overall, fireball ships are the most commonly seen, according to the data, followed by spherical and then triangular craft. The most common month for UFO sightings is July, according to the data, with 9,892 reported sightings over all, while between 9pm and 10 pm is the most common time to spot an alien craft. This may be because people tend to spend more time outside in the summer months. A map that reveals every official sighting of a UFO over the past 76 years suggests that we are experiencing more cosmic traffic than ever before. Many of the sightings can be put down to the development of drones and new aircraft technologies, but some enthusiasts believe it is because of rise in alien activity. The interactive map was created by writer Levi Pearson, who used a UFO sighting dataset from the National UFO Reporting Centre and open source software from CartoDB. Published in the QuantBait website, it begins in 1933 with the first UFO sightings being spotted over California and Nebraska in the US, the UK and France in Europe, and locations in Japan and Australia. The number of sightings increases dramatically between the 1940s and the 1960s across the world, according to the map. In the US, sightings documented during the 1940s include the famous Battle of Los Angeles and Roswell UFO Incident. While it’s possible that there were more UFO visitations during the decade, officials at the time put it down to people being nervous about World War II, and seeing objects in the sky. Nigel Watson, author of the UFO Investigations Manual, told MailOnline: ‘Sightings of strange things in the sky have been reported for centuries, though it was only with them being labelled as flying saucers or UFOs that people began to realise that this is a worldwide phenomenon. ‘UFO sightings often come in sudden and short-lived periods, which ufologists call flaps or waves. ‘Often specific locations seem to be highly attractive to UFOs, and these locations are known as UFO window areas or UFO portals. Bonnybridge is known as the UFO capital of Scotland and there are said to be some 300 sightings every year, although not all of these are shown on the map. Cannock Chase in the Midlands has been a UFO hotbed since the1960s when there were first reports of a crashed craft, and earlier this year, residents reported seeing slow-moving aircraft making a loud buzzing noise moving across the sky. There appear to be repeated UFO sightings in the Midlands shown on the map during the 1960s, with clusters of activity also seen in the Netherlands, Germany and other parts of central Europe. There is a marked increase in sightings on the map during the 1950s and 1960s, all across the US shown on the map. In Europe, the map shows many sightings over Belgium, between 1989 and 1990, which is known as the Belgium Wave. At that time, some 13,500 people claimed to have seen huge black triangles flying silently through the skies. While the incident was tracked by Nato radar and investigated by the country’s military, nothing unusual was found and sceptics believe the sightings may have been of ordinary helicopters. 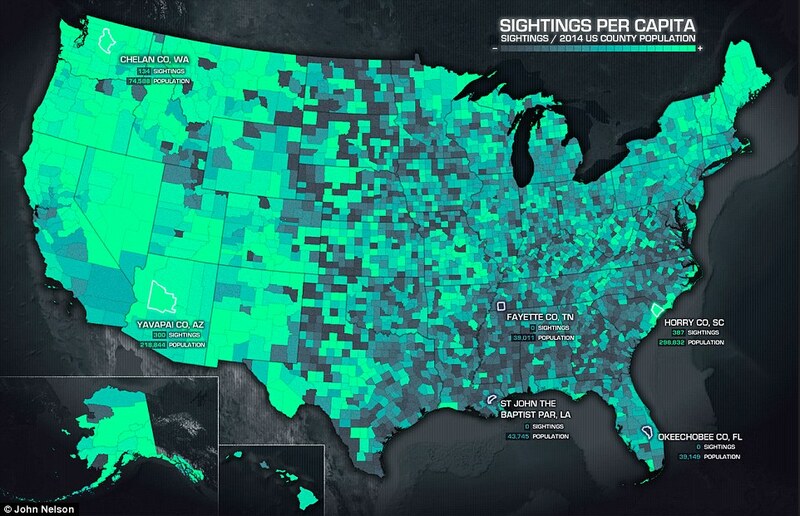 From the mid-1990s onwards, the explosion of sightings intensify on the map, with large concentrations over the West Coast and the whole eastern half of the US, from Texas. The map shows the whole of Europe ablaze with circles indicating UFO sightings, as well as areas of western Africa, India, South East Asia and South America. The global nature of the sightings suggests this could be down to the widespread uptake of the internet, which allowed people to share sightings more easily than before. Mr Watson said: ‘With the coming of the internet it is easier for people to report UFO sightings and this is probably one reason for a rise in sightings.